I've just returned from a business trip to sunny Las Vegas, so over the next few day's I'm going to put in effort to get up to date with our daily photos! Since the weather in Cape Town currently seems like the kind one would expect to experience in England - you know, the wet, cold and rainy kind, I think it's perfect to write about Winchester Mansions (map), a local little gem where one can go to have the most awesome English tea with scones. Besides for the service being good and the scones being tasty and warm, the venue is simply exquisite. 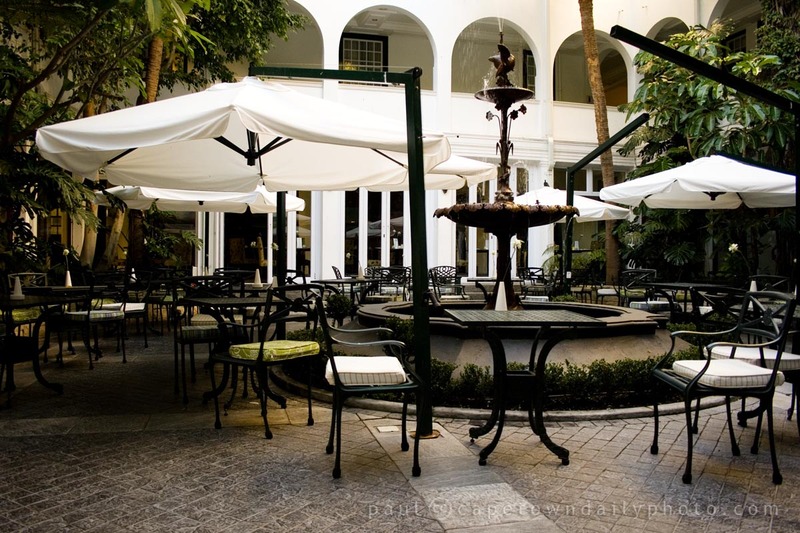 One enters at the hotel's reception area and walks straight past the concierge's desk to this little courtyard, filled with trees, a large water feature, tables and chairs, and surrounded by the quaint-looking hotel rooms. It really is a beautiful setting for a quiet afternoon outing. The courtyard is a little chilly on cooler days, so consider taking a light jersey or jacket along if you, like me, easily get cold. Posted in General and tagged hotel, restaurant on Tuesday, 4 May, 2010 by Paul. Aaah, this is one of my favourite tea spots! Also lovely for sundowners in the summer. And they do a Sunday brunch with jazz. I was going to say the same thing. It’s a lovely spot for sundowners in summer. It’s (usually) very peaceful and the birds come out, just to add to the atmosphere. I’ve conducted interviews for articles there before because it’s just such a pleasant place to meet someone and have a conversation. I’ve never thought to try it in winter. I must do that. Now this is a photo that really made me smile, sat in this courtyard so many times especially in the mornings for coffee and scones and of course been back there early evening for the odd G&T – will always be a favourite of ours, thanks for the memory Paul..
I’ve always admired the front facade of the Winchester Hotel, particularly as it relates to the promenade infront of it. Have never thought to go beyond it – will certainly make a point of going to enjoy some scones and tea when I go down to CT in June. What a beautiful, stylish looking place! I can imagine it’s a place that you’d enjoy Emm. I’ll post a photo of the interior some time – it’s lovely.